described a spoonbill rostrum lacking teeth in place. They correctly compared it to the much smaller pterosaur Gnathosaurus and called their English find Plataleorhynchus stretophorodon (Fig. 1, BMNH R 11957). As you can see, it was much bigger. Figure 1. Plataleorhynchus stretophorodon as originally interpreted (at far left) as newly interpreted (near left) with comparisons to Gnathoosaurus (right). Note the exposure is in dorsal view, not palatal view, and the premaxilla includes only 4 teeth, as in other pterosaurs. Yes, the premaxilla ‘pops up’ three times from beneath the maxilla and nasals in Gnathosaurus. Click to enlarge. Howse and Milner did not realize they were looking at the rostrum in dorsal aspect. And for that reason, perhaps, they did not correctly figure the lateral extent of the premaxilla (Fig.1). No pterosaur has more than four teeth erupting from the premaxilla and Plataleorhynchus was no exception. So the premaxilla had a very short anterior exposure, rather than encompassing the entire spoonbill, as Howse and Milner interpreted the fossil from firsthand observation. Howse and Milner did correctly note differences in the rostral shape and relative tooth size between Plataleorhynchus and Gnathosaurus, and also correctly noted that no other known pterosaur was closer. So, by this evidence, some mistakes don’t matter in the end. Plataleorhynchus had dorsally expanded maxillae that contacted one another over the premaxilla aft of the spoonbill. Due to their orientation mistake, Howse and Milner identified the second dorsal appearance of the premaxilla as the palatine. Howse and Milner thought the palate had a horny pad based on the rugosity that was exposed. That rugosity, (here considered dorsal) is also present in Gnathosaurus, but not as prominent. The reason or origin for the rugosity on the dorsal tip of Plataleorhynchus is difficult to explain, but may be related to the further extent of the maxillae and perhaps some sort of small horny crest. the palatal extent of the premaxilla is much smaller in the comparable Gnathosaurus than envisioned for Plataleorhynchus by Howse and Milner. In Gnathosaurus I’m not sure how the teeth were not shaken loose. The roots appear to be exposed on the palate (Fig. 1). They must have been held in place by soft tissue. much has been made about the value of firsthand observation versus the examination of photographs and illustrations. Paleontologists are fond of dismissing interpretations made in the absence of the fossil itself. They forget that most of the credit or blame for a discovery happens not in the lab, but between the ears. You have to see things correctly from the start or all the dominoes start to fall the wrong way. Mistakes can happen to anyone (including yours truly). Howse and Milner 1995 (Fig. 1) is another example of a firsthand observation that went awry based on one initial mistake. And that was an easy one to make with that odd spoonbill rostrum. It was flat on both sides. Like Cope vs. Marsh back in the day, I am, once again metaphorically, “putting the skull on the other end of the skeleton” by flipping over the rostrum of Plataleorhynchus. The correct response, of course, should be curiosity or gratitude, not embarrassment, anger or dismissal. However, if anyone out there thinks the rostrum exposure is still palatal, I’d like to hear from you. Howse SCB and Milner AR 1995. The pterodactyloids from the Purbeck Limestone Formation of Dorset. Bulletin of the Natural History Museum London (Geology)51:73-88. This entry was posted in academic publication, ctenochasmatid, Digital Graphic Segregation, pterosaurs and tagged ctenochasmatids, dgs, digital graphic segregation, pterosaur by davidpeters1954. Bookmark the permalink. That the maxillary alveoli are borne on ridges that are raised above the occlusal surface of the jaw supports the interpretation that the specimen is preserved in ventral aspect. The sutures are not preserved well enough to have any opinion on the number of premaillary teeth in pterosaurs. That said, Ctenochasmids have a lot of teeth, a LOT of teeth. There is nothing stopping the developmental mutation that affected the maxillarys and dentaries from similarily affecting the premaxillaries. So if any pterosaurs did deviate from a 4 teeth/premaxillary rule, it would be Ctenochasmids. Lots of IFs and WOULDs there. I wish you had some evidence Chris. Not sure we can call the lateral alveoli on such a spoonbill and their presumed teeth ‘occulsal.’ This morphology is odd compared to all other tetrapods. If you can find ANY pterosaur with more than four teeth in each premaxilla, please bring it to my attention. Having done the work already on several hundred taxa, I haven’t been able to find a set of five or six yet. Sorry, I’ve got to go with the evidence here. I pointed out a feature (raised margins along the edge of the maxilla, containing visible alveoli) that you can easily see, and that is best explained as the specimen being preserved as originally interpreted. That’s evidence. Colouring in shapes over a schematic drawing is a hypothesis, one to which you have failed to support with evidence. It doesn’t matter how many premaxillary teeth there were since you cannot trace the sutures you cannot determine the actual count therefore their number cannot be used to support either hypothesis. Going back to the original post… no other pterosaur has more than four pmx teeth, therefore Plataleorhynchus would have to have had an autapomorphy. 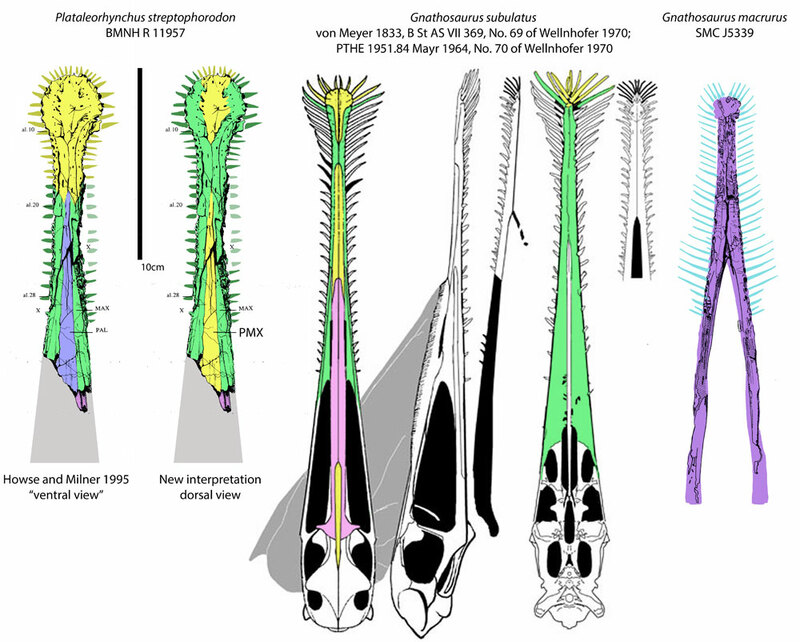 All ctenochasmatids wrap the maxilla OVER the premaxilla and so does Plataleorhynchus. The extent of the palatal portion of the pmx in Gnathosaurus is tiny, but if not in Plataleorhynchus, that, too, is a wicked autapomorphy. In no other pterosaur is the anterior palate (premaxilla in palatal view) rugous, so that, too would be an autapomorphy. In Gnathosaurus the maxilla meet one another on the palate for a considerable distance. That distance is not matched by Plataleorhynchus and the central “palate” bone would be a fused set of vomers, not a palatine or palatines. “Raised margins along the edge of the maxilla containing visible alveoli” means what? The slight upward curve expected at the jaw margins if the specimen were a typical tetrapod rostrum in palatal view and teeth erupting in a typical fashion? Can you tell me there were not also depressed margins along the maxilla? Not sure what to make of such an observation when the teeth erupt laterally. I can see why you’re clinging to this evidence, Chris, but weigh this against the rest of the evidence above. Hang in there. Paradigm busting is not something humans do easily.